Application : Sodium bicarbonate has a wide variety of uses. Cooking, Sodium bicarbonate, referred to as baking soda, is primarily used in baking, as a leavening agent. It reacts with acidic components in batters, releasing carbon dioxide, which causes expansion of the batter and forms the characteristic texture and grain in pancakes, cakes, quick breads, soda bread, and other baked and fried foods. Acidic compounds that induce this reaction include phosphates, cream of tartar, lemon juice, yogurt, buttermilk, cocoa and vinegar. Natural acids in sourdough can be leavened with the addition of small amounts as well. Heat can also independently cause sodium bicarbonate to act as a raising agent by releasing carbon dioxide when used in baking. When used on its own, only half the available CO2 is released. Additionally, without an acid added to baking soda, sodium carbonate is produced that is strongly alkaline and gives the baked product a bitter, "soapy" taste and a yellow color. Baking powder differs in that it includes an acid which is activated by the addition of water. Carbon dioxide production from exposure to heat starts at temperatures above 80 °C. 2 NaHCO3 → Na2CO3 + H2O + CO2 Since the reaction occurs slowly at room temperature, mixtures (cake batter, etc.) can be allowed to stand without rising until they are heated in the oven. Many forms of baking powder will contain sodium bicarbonate combined with calcium acid phosphate, sodium aluminium phosphate or cream of tartar. Sodium bicarbonate was sometimes used in cooking vegetables, to make them softer, although this has gone out of fashion, as most people now prefer firmer vegetables. However, it is still used in Asian and Latin American cuisine to tenderise meats. Baking soda may react with acids in food, including vitamin C (L-ascorbic acid). It is also used in breading such as for fried foods to enhance crispness and allow passages for steam to escape, so the breading is not blown off during cooking. Pest control, Used to kill cockroaches. Once consumed, it causes internal organs of cockroaches to burst due to gas collection. Sodium bicarbonate can be an effective way of controlling fungal growth, and in the United States is registered by the Environmental Protection Agency as a biopesticide. Paint and corrosion removal, Sodium bicarbonate is used in a process for removing paint and corrosion called sodablasting; the process is particularly suitable for cleaning aluminium panels which can be distorted by other types of abrasive. Alkalinity/pH increase, It can be administered to pools, spas, and garden ponds to raise the total alkalinity, this will also raise the pH level and make maintaining proper pH easier. In the event that the pH is low and the alkalinity is adequate or high, Baking Soda (sodium bicarbonate) should not be used to adjust the pH. Pyrotechnics, Sodium bicarbonate is one of the main components of the common incendiary "black snake" firework. The effect is caused by the thermal decomposition, which produces carbon dioxide gas to produce a long snake-like ash as a combustion product of the other main component, sucrose. Mild disinfectant, It has weak disinfectant properties, and it may be an effective fungicide against some organisms. Because baking soda will absorb musty smells, it has become a reliable method for used-book sellers when making books less malodorous. Fire extinguisher, Sodium bicarbonate can be used to extinguish small grease or electrical fires by being thrown over the fire, as heating of sodium bicarbonate releases carbon dioxide. However, it should not be applied to fires in deep fryers; the sudden release of gas may cause the grease to splatter. Sodium bicarbonate is used in BC dry chemical fire extinguishers as an alternative to the more corrosive diammonium phosphate in ABC extinguishers. The alkaline nature of sodium bicarbonate makes it the only dry chemical agent, besides Purple-K, that was used in large-scale fire suppression systems installed in commercial kitchens. Because it can act as an alkali, the agent has a mild saponification effect on hot grease, which forms a smothering, soapy foam. Neutralisation of acids and bases, Sodium bicarbonate is amphoteric, reacting with acids and bases. It reacts violently with acids, releasing CO2 gas as a reaction product. It is commonly used to neutralize unwanted acid solutions or acid spills in chemical laboratories. A wide variety of applications follows from its neutralisation properties, including reducing the spread of white phosphorus from incendiary bullets inside an afflicted soldier's wounds. Medical uses, See also: Intravenous sodium bicarbonate, Sodium bicarbonate mixed with water can be used as an antacid to treat acid indigestion and heartburn. Its reaction with stomach acid produces salt, water, and carbon dioxide: NaHCO3 + HCl → NaCl + H2O + CO2(g) Intravenous sodium bicarbonate is an aqueous solution that is sometimes used for cases of acidosis, or when insufficient sodium or bicarbonate ions are in the blood. In cases of respiratory acidosis, the infused bicarbonate ion drives the carbonic acid/bicarbonate buffer of plasma to the left and, thus, raises the pH. It is for this reason that sodium bicarbonate is used in medically supervised cardiopulmonary resuscitation. Infusion of bicarbonate is indicated only when the blood pH is markedly (<7.1–7.0) low. It is used for treatment of hyperkalemia, as it will drive K+ back into cells during periods of acidosis. Since sodium bicarbonate can cause alkalosis, it is sometimes used to treat aspirin overdoses. Aspirin requires an acidic environment for proper absorption, and the basic environment diminishes aspirin absorption in the case of an overdose. Sodium bicarbonate has also been used in the treatment of tricyclic antidepressant overdose. It can also be applied topically as a paste, with three parts baking soda to one part water, to relieve some kinds of insect bites and stings (as well as accompanying swelling). Sodium bicarbonate has been found to have no effect on the blood pressure of several types of rat models susceptible to salt-sensitive hypertension, in contrast with sodium chloride. This was ascribed to the high concentration of chloride, rather than the sodium content in dietary salts. Sodium bicarbonate can be used to treat an allergic reaction to plants such as poison ivy, poison oak, or poison sumac to relieve some of the associated itching. Bicarbonate of soda can also be useful in removing splinters from the skin. Some alternative practitioners, such as Tullio Simoncini, have promoted baking soda as a cancer cure, which the American Cancer Society has warned against due to both its unproven effectiveness and potential danger in use. Sodium bicarbonate can be added to local anaesthetics, to speed up the onset of their effects and make their injection less painful. It is also a component of Moffett's solution, used in nasal surgery. Personal hygiene, Toothpaste containing sodium bicarbonate has in several studies been shown to have a better whitening and plaque removal effect than toothpastes without it. Sodium bicarbonate is also used as an ingredient in some mouthwashes. It has anticaries and abrasive properties. It works as a mechanical cleanser on the teeth and gums, neutralises the production of acid in the mouth, and also acts as an antiseptic to help prevent infections. Sodium bicarbonate in combination with other ingredients can be used to make a dry or wet deodorant. Sodium bicarbonate may be used as a buffering agent, combined with table salt, when creating a solution for nasal irrigation. It is used in eye hygiene to treat blepharitis. This is done by addition of a teaspoon of sodium bicarbonate to cool water that was recently boiled, followed by gentle scrubbing of the eyelash base with a cotton swab dipped in the solution. In sports, Small amounts of sodium bicarbonate have been shown to be useful as a supplement for athletes in speed-based events, such as middle-distance running, lasting from about one to seven minutes. However, overdose is a serious risk because sodium bicarbonate is slightly toxic; and gastrointestinal irritation is of particular concern. Additionally, this practice causes a significant increase in dietary sodium. As a cleaning agent, a paste from baking soda can be very effective when used in cleaning and scrubbing. For cleaning aluminium objects, the use of sodium bicarbonate is discouraged, as it attacks the thin unreactive protective oxide layer of this otherwise very reactive metal. A solution in warm water will remove the tarnish from silver when the silver is in contact with a piece of aluminium foil. A paste of sodium bicarbonate and water is useful in removing surface rust as the rust forms a water-soluble compound when in a concentrated alkaline solution. Cold water should be used, as hot water solutions can corrode steel. Baking soda is commonly added to washing machines as a replacement for softener and to remove odor from clothes. Sodium bicarbonate is also effective in removing heavy tea and coffee stains from cups when diluted with warm water. Also, Baking soda can be used as an ultimate multi purpose odor remover. During the Manhattan Project to develop the nuclear bomb in the early 1940s, many scientists investigated the toxic properties of uranium. They found that uranium oxides stick very well to cotton cloth, but did not wash out with soap or laundry detergent. The uranium would wash out with a 2% solution of sodium bicarbonate (baking soda). Clothing can become contaminated with depleted uranium (DU) dust, and then normal laundering will not remove it. Those at risk of DU dust exposure should have their clothing washed with about 6 ounces (170 g) of baking soda in 2 gallons (7.5 l) of water. 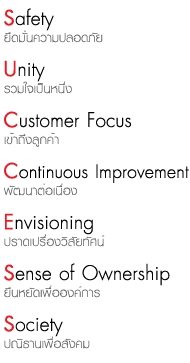 Cattle feed supplements, Sodium bicarbonate is sold as a cattle feed supplement, in particular as a buffering agent for the rumen. 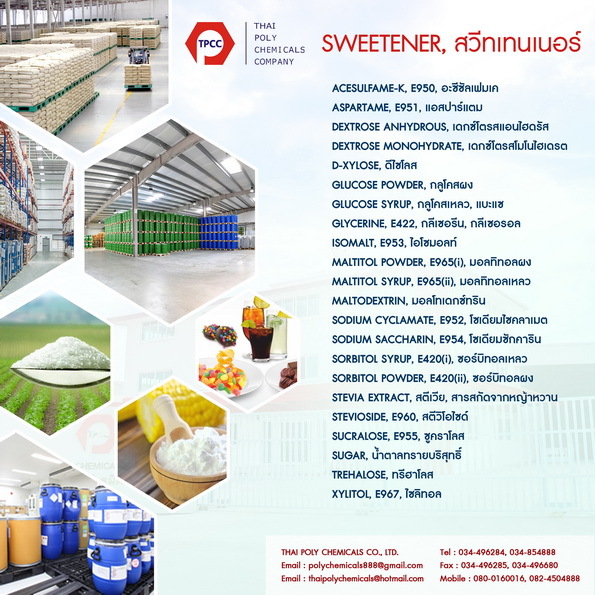 please contact Thai Poly Chemicals Co., Ltd.